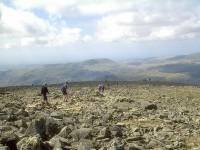 An ascent of England's highest mountain, the 3210ft summit of Scafell Pike, from Seatoller in Borrowdale. I've started off from Seatoller, the end of the bus ride from Keswick, and have ascended Grains Gill via Seathwaite farm. 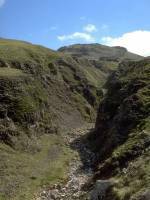 Having already got plenty of shots of Grains Gill I didn't start snapping away until I'd turned left to climb up past Ruddy Gill to Esk Hause. Allen Crags is seen up ahead. 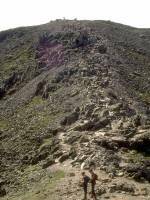 The start of the climb from Esk Hause, one of Lakeland's most famous path junctions, to Scafell Pike. 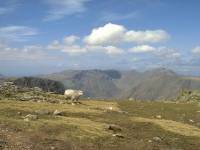 Great Gable and Green Gable are seen a couple of miles away. 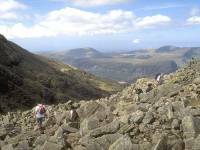 The walk across Ill Crag's boulder field, at just below 2900ft, is rough and hard work. 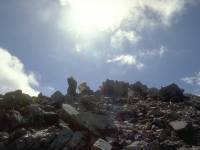 The last easy ground on the ascent. 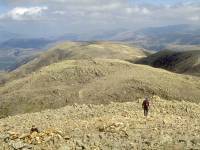 Broad Crag is ahead and to the right; Scafell Pike itself is the trapezoid-shaped summit threequarters of a mile to the south. 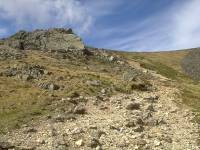 The second boulder field is reached on the flanks of Broad Crag at 2950ft. Broad Crag col is seen ahead. 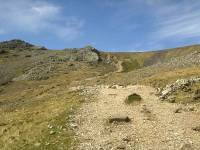 The path drops to the 2900ft col between Broad Crag and Scafell Pike, seen just a few hundred yards ahead now. 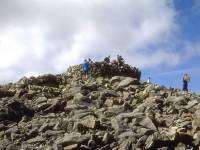 Ray McHaffie and his team built this summit cairn and shelter a few years ago for the National Trust, who own the mountain. 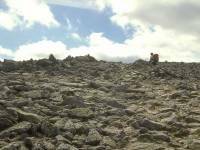 They had to walk 5 miles and climb 3000ft to work each day for six weeks. Ray gives a very entertaining slide show three nights a week in Keswick, to raise money for the Borrowdale mountain rescue team. Highly recommended. 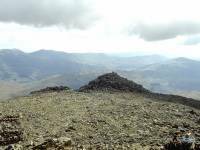 Looking due north from the summit. Styhead Tarn is seen a couple of miles away. 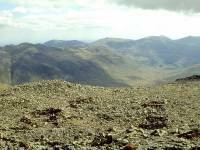 Maiden Moor is the prominent top in the middle distance to the left, beside which Derwentwater can just be seen. Skiddaw and Blencathra apear on the skyline, each around 14 miles away. Broad Crag, Great End and the shoulder of Ill Crag feature prominently in this view to the northeast. The Dodds appear in the distance, roughly ten miles away. 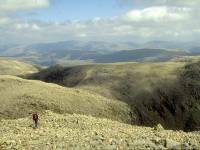 Looking ENE towards Helvellyn and its neighbours in the distance. 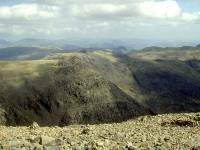 The dark dome in the middle distance is Ullscarf; The approach path to Scafell Pike can be seen crossing the col between Ill Crag and Broad Crag. 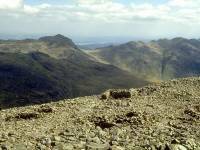 Centred slightly north of east, this view across the shoulder of Ill Crag also encompasses Esk Pike and the Langdale Pikes (the prominent little cone in the centre of shot is Pike O'Stickle). 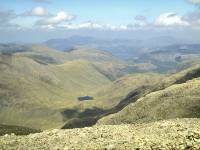 Fairfield appears beyond, with High Street about 15 miles away on the skyline. 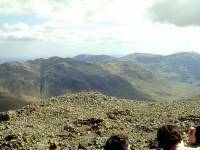 The view ESE with Bowfell to the left and Crinkle Crags to the right. 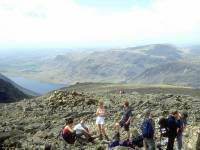 Windermere appears between them, with Ingleborough some 35 miles beyond in the Pennines. Looking southeast. 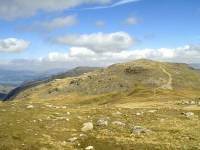 Crinkle Crags, with the vertical gash of Rest Gill, is on the left; some of the Coniston fells, notably Wetherlam, are on the right. 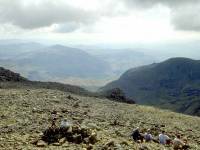 The view SSE takes in Crinkle Crags, Wetherlam, Swirl How and the Old Man of Coniston. That's the Duddon Valley (or Dunnerdale) down on the right, one of the two valleys in Lakeland that don't have a lake. Looking a few degrees east of south, this shot is centred on Scafell Pike's south top and looks down the length of Dunnerdale to the Furness coast. 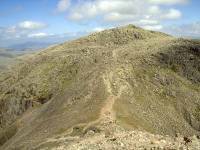 Walna Scar is on the left, Harter Fell to the right. 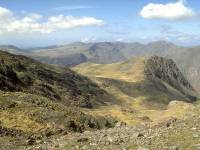 The view SSW across the eastern shoulder of Scafell into Eskdale, the other lakeless valley. 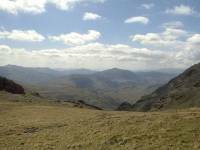 Harter Fell is on the left, four miles away. 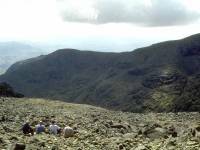 Looking southwest across the bulk of Scafell. 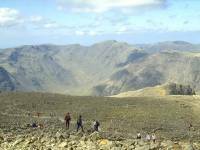 Southwestwards to Scafell, England's second highest mountain. 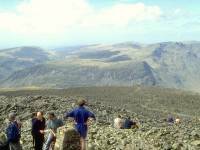 Scafell Crag rises to the right. 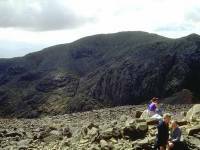 WSW to Scafell Crag. 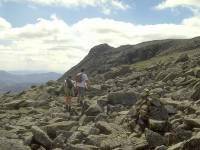 The col between Scafell Pike and Scafell is called Mickledore and is out of sight from the summit. 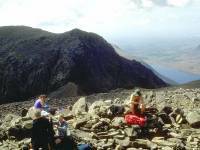 Wastwater appears to the right, with the Irish Sea out beyond lower Wasdale. On clear days the Isle of Man can be seen. Looking slightly south of west, across Wastwater towards Buckbarrow and Seatallan. Yewbarrow appears across the unseen Wastwater, and beyond it are Seatallan (to the left) and Haycock (to the right). 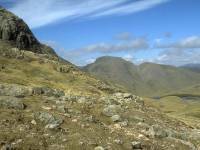 Looking northwest into the bowl of Mosedale, with Red Pike, Scoat fell, Steeple, Pillar and Kirk Fell surrounding it. 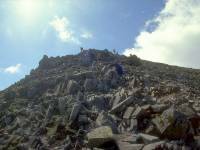 The High Stile group is further back to the right. North northwest across Lingmell and Kirk Fell in the direction of Buttermere and Crummock Water. 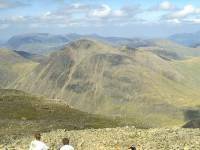 High Stile is on the left in the distance; the Grasmoor group is to the right. On clear days Scotland can be seen across the Solway firth through the gap in the middle. 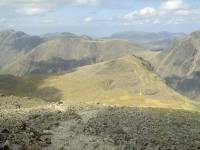 Looking just west of north, towards the shapely cone of Great Gable two miles away. 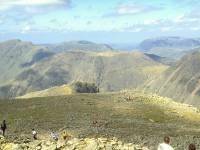 Grasmoor, Eel Crag and Grizedale Pike crowd the skyline to the left, with Skiddaw to the right. 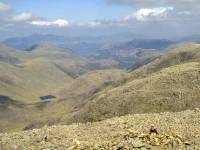 And back where we started, looking north across Styhead Tarn towards Derwentwater, Keswick and Skiddaw. 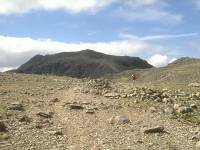 Walking northwest off the summit, past Dropping Crag, towards the col between Scafell Pike and Lingmell. 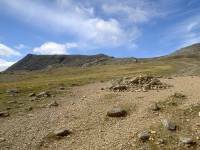 The simple path up to Lingmell (2649ft) is seen beyond the col. Kirk Fell appears futher beyond. The weather turned at this point and I took no more photos on this walk - just for the record, however, I tracked back to the col and dropped down to the Corridor Route, returning to Seatoller via Sty Head. I caught the bus back to Keswick with just six minutes to spare.